(Bloomberg) -- Former Goldman Sachs Group Inc. partner Donald Mullen has raised another $1 billion to invest in U.S. rental houses as his firm, Pretium Partners LLC, leases homes to tenants shut out of an inventory-starved sales market. Pretium closed on its second single-family rental fund with more than $1 billion in equity commitments, demonstrating that investors see staying power in an asset class once viewed as a short-term trade on distressed homes. The company, which closed on a $1.18 billion fund in 2013, owns 26,000 homes in 15 markets, including 5,000 homes acquired through the new fund. 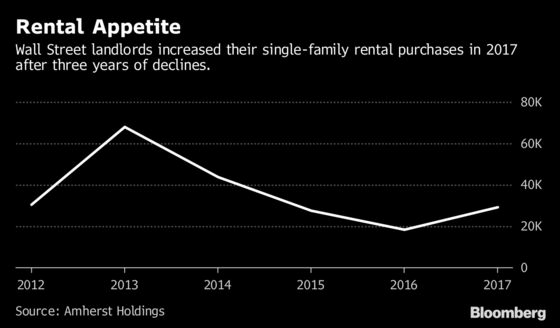 That makes it the third-largest single-family landlord, after the real estate investment trusts Invitation Homes Inc. and American Homes 4 Rent. Pretium recently hired Chaz Mueller, former president of Irvine Co.’s apartment business, to serve as chief executive officer of its management arm, Progress Residential. Mullen founded Pretium in 2012, when investors were buying distressed homes in the aftermath of the foreclosure crisis. After a lull, the big landlords stepped up purchases again last year, according to data compiled by Amherst Holdings LLC, as a shortage of for-sale listings drives millennial families to rental houses. “A growing demographic of financially stable young adults, coupled with high barriers for homeownership and limited supply of entry-level housing, has created significant demand for quality single-family rental homes,” Dana Hamilton, head of real estate at Pretium, said in a statement.